There’s an often over- looked fruit that’s sold in your local supermarket or fruit stand that can curb sweet cravings and have powerful implications on your health and your waistline. Not to mention, they’re damn tasty. I’m talking about the plum. Plums are loaded with vitamins and antioxidants which can help speed recovery after a particularly grueling workout. Studies also show a possible connection between increased antioxidant intake and lowering incidences of certain forms of cancer. Most of the press about antioxidants lately has been about the exotic newcomers to the market–the gogi, noni and acai berries. These are usually sold as expensive juice blends at local health food stores and through multi level marketing businesses. A compelling story about where they come from and how hard they are to obtain is usually what marketers use to rationalize the jacked up price. Although these berries are packed with the goods, why not just head to the local market and pick up a bag of fresh plums, which come for a fraction of the price and pack an antioxidant punch on par (if not more) than another superfruit–the blueberry. Plums can fit seamlessly into your weight loss program as well (you can check out our FREE Carb manipulation Protocol here). 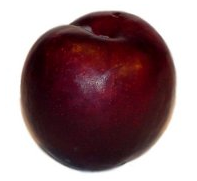 A medium, ripened plum contains about 40 calories with 2 grams fiber. They’re a great snack if you’re dieting because they’re low in calories, contain a nice amount of fiber, and best of all- crush cravings for sweet foods. With the warm weather coming up they can also make a juicy and delicious dessert on a summer day!